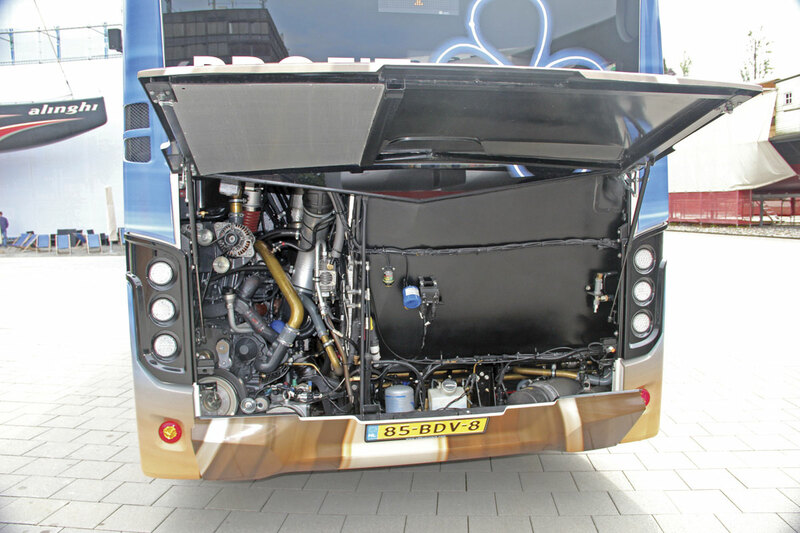 The demands of European legislation may be ever more prescriptive but so is the inventiveness of the manufacturers in the bus building industry. 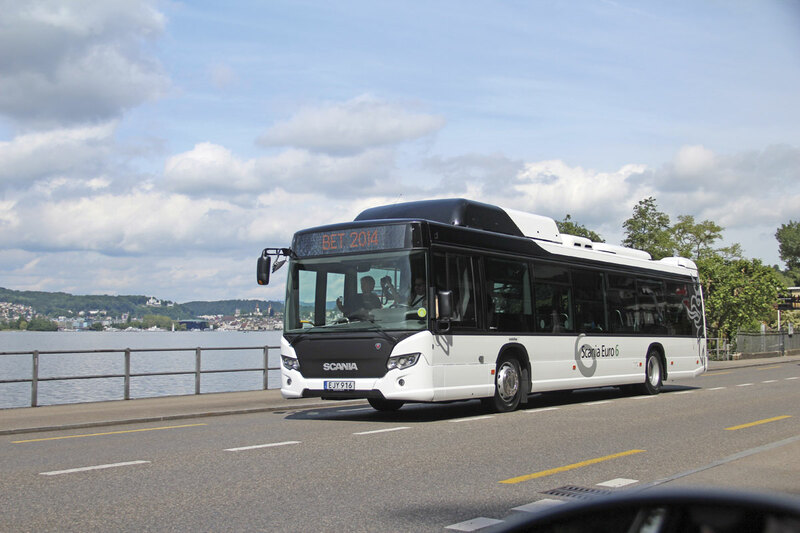 This was abundantly clear at the latest BusEuroTest, staged in the Swiss city of Lucerne in early June, to determine which bus will be awarded the International Bus of the Year 2015. It was organised by Bruno Niederburger of the magazine TIR News with the help of colleagues and attracted a strong field of candidates from major European manufacturers. The International Bus of the Year trophy is awarded on alternate years with the International Coach of the Year title. 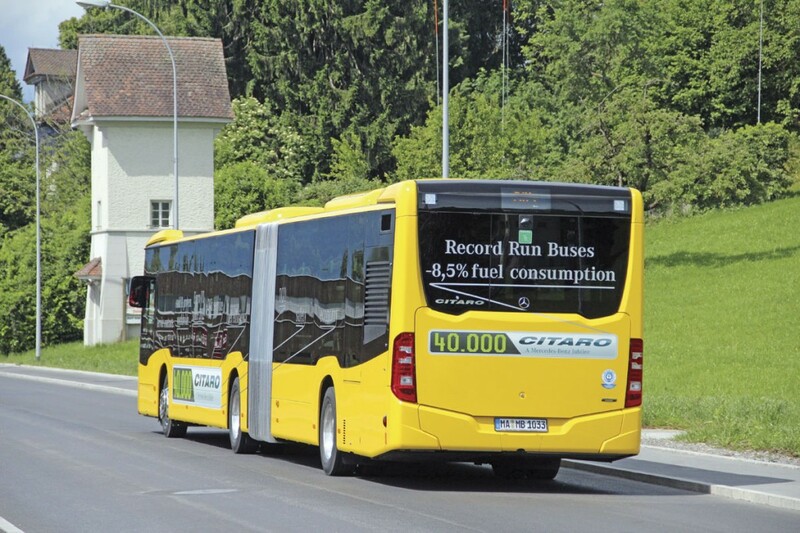 The current holder of the award is the Mercedes-Benz Citaro 2 Euro6 diesel, the Bus of the Year 2013, which won the accolade following the BusEuroTest staged in 2012 in Versailles. The current International Coach of the Year is the Setra S515HD Comfort Class which triumphed at the CoachEuroTest 2013 held in Ybbs, Austria. Each EuroTest brings together the members of the Jury which are drawn from 20 of Europe’s leading bus and coach industry trade magazines. They ride on and drive each of the candidates over the course of three days of testing and also hear presentations from the different manufacturers. On the final day the jurors meet to run through the good and bad points of the buses before the voting takes place. Only those who participate in the test are entitled to vote for the winner. It is a tradition of the competition that only a winner is announced, there are no other placings revealed. Each of the magazines represented participates at their own expense, though evening meals and other catering is sponsored by suppliers including ZF, Busworld, Continental and the Swiss publishing company, MotorMedia GmbH. 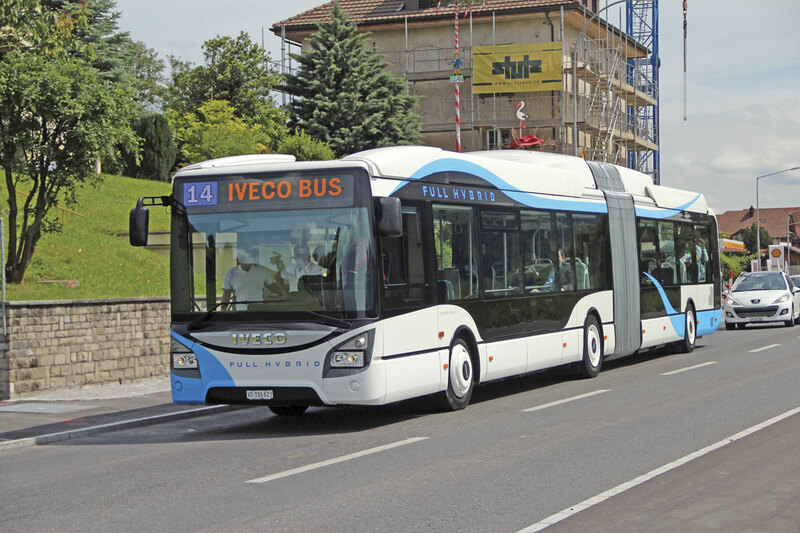 In Europe the buying trend is strongly favouring higher capacity buses and while in the UK the favoured option for meeting capacity needs is the double decker, in Europe it is the articulated bus. 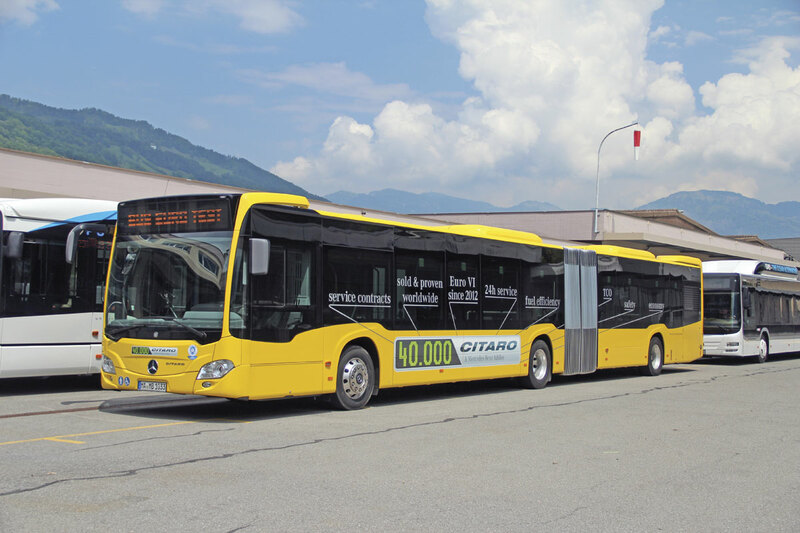 Though there was no stipulation that entrants had to enter an articulated vehicle – the requirement was that buses should be Euro6 or better, standard production models of over 10m in length – four of the five buses entered were articulated designs. 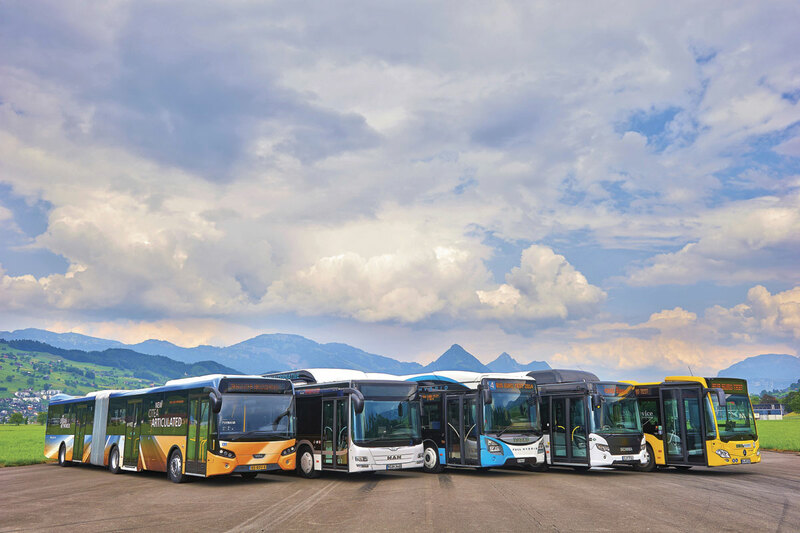 They were: the Mercedes-Benz Citaro G Euro6; the VDL Citea SLFA 180/360; the MAN Lion’s City G CNG; the Iveco Urbanway Full Hybrid; and the only 12m candidate, the Scania Citywide CNG. With a backdrop of Lake Lucerne and the Alps, the setting was perfect. 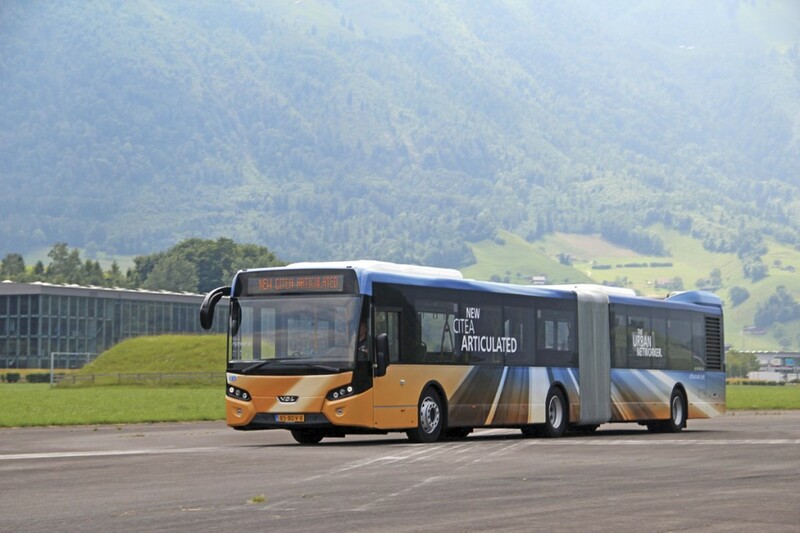 In the past the candidate vehicles have usually operated from the premises of a local operator but this year, though Verkehrsbetriebe Luzern (VBL) (see article in issue 1288, 8 August 2014) fully supported the event, the buses began and ended their test runs from within the Swiss Museum of Transport or Verkehrshaus. 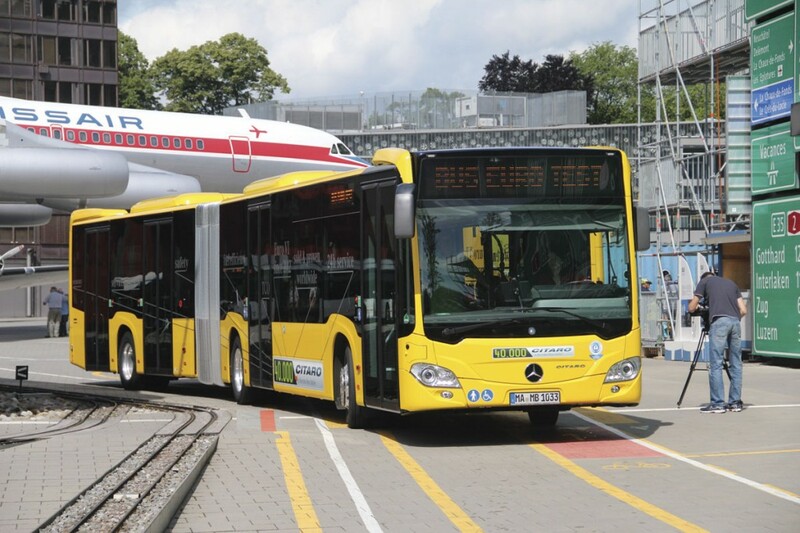 The most visited museum in Switzerland and must-see attraction for transport enthusiasts and children, it is a fabulous interactive facility with complete planes and a large collection of trains, trams, cars, boats and other transport forms, though surprisingly, very few buses and coaches. In this article the candidates are arranged in no particular order. There isn’t space to give the full low down on each of them but hopefully I can give you some idea of their characteristics. 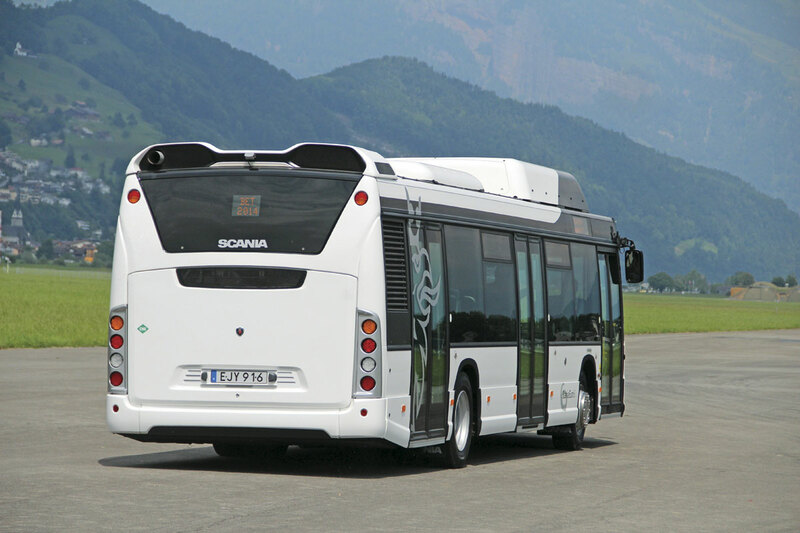 In a sense, the Euro6 Citaro entry had already won the Bus of the Year as it was the articulated version of the vehicle that currently holds the title. It is a bus that the UK is now becoming familiar with, though only in the 12m and shorter Citaro K formats thanks largely to Mayor Boris’s groundless vilification of the articulated version. Worldwide, well over 40,000 Citaros of all models have been delivered. In articulated form it is powered by the new 10.7-litre Mercedes-Benz OM470 Euro6 engine which delivers 394hp/290kW and peak torque of 1,900Nm at 1,100rpm. A less powerful 360hp/265kW/1700Nm variant is also available. Both have the electronically controlled X-Pulse common rail system with hydraulic pressure booster that can boost pressure within individual injectors to as high as 2100 bar. The OM470 employs an SCR system requiring AdBlue additive in the catalytic converter to deal with NOx emissions, though the level required has been cut to between 2-4%. 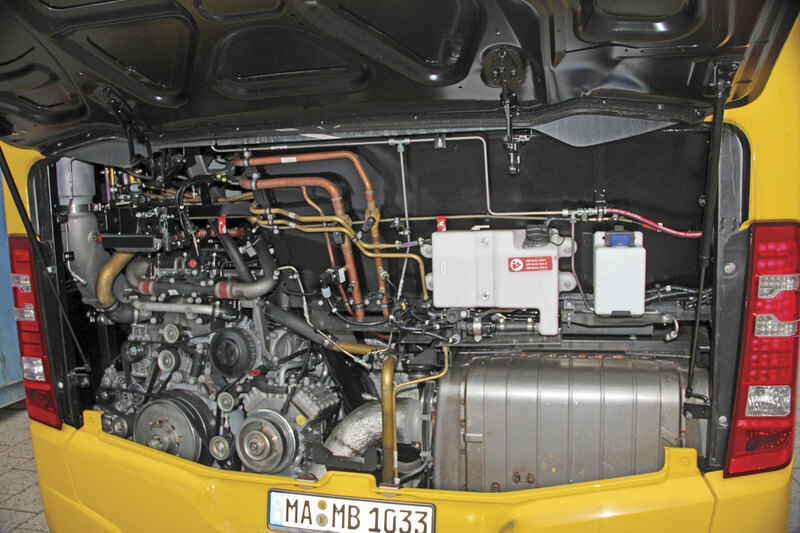 The company would normally offer large engines in Switzerland where gradients are often steep though it is on the point of introducing the 7.7-litre OM936 engine as an alternative for locations with a flatter terrain. Initially cautious about promising fuel savings from the new engine range, the growing level of evidence Daimler is building up is making it more bullish about saying what it expects from the new units, which also benefit from longer service intervals. With more Euro6 units on the road than any other European bus and coach supplier, they reckon you can expect to achieve up to 8.5% better fuel economy than with Euro5. Measuring 18.125m, the model is currently the longest in the Mercedes-Benz range because there is currently no 18.75m long option and the extra long CapaCity version has yet to be developed for Euro6. A whole host of new developments were introduced along with the new model range and these were described in some detail two years ago. They include: a recuperation module which saves electrical power generated in overrun mode to help power the ancillaries, a raised driving position, doors with a reduced air requirement, and, because of the reduced consumption, an AdBlue tank reduced from 46 to 32-litres on the artic. Mercedes-Benz had not gone for a turntable with enhanced light conducting abilities and for this reason this section of the bus felt comparatively dark. One of their representatives told me that they had considered adding such a turntable to the specification but had not done so because in operation they are exceedingly difficult to keep clean and once they have collected fallen leaves within the bellows section they soon look scruffy. 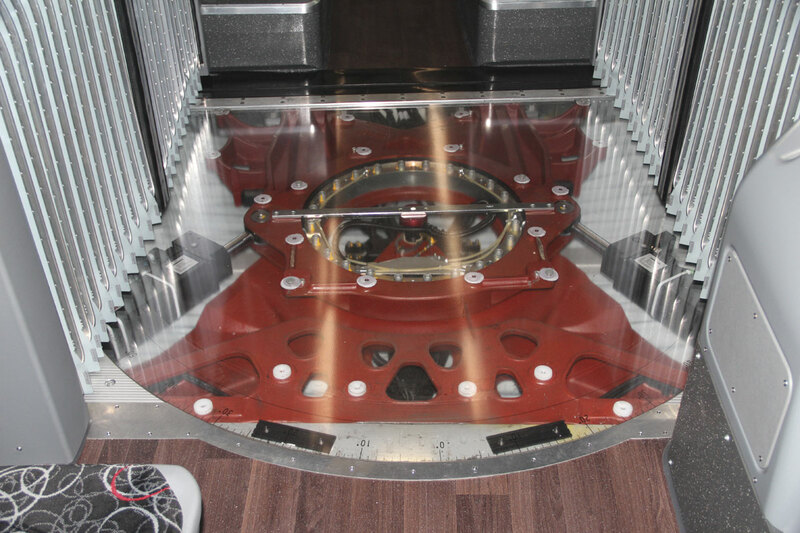 To illustrate the workings of the special levelling system in the turntable which only acts when there is a need for it do so, Mercedes-Benz had fitted a Perspex glazed section, rather than the usual metal cover, over the unit. It was a bit of a gimmick but an interesting one in contrast to the wood effect flooring of the rest of the bus. At €390,000/£310,000 it wasn’t cheap, but I don’t imagine many would go for this level of interior specification. 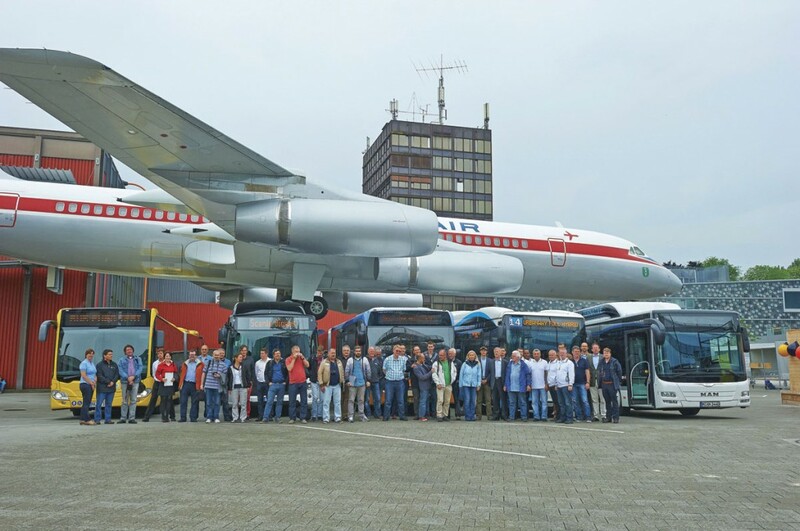 Although the front wheelbase was the longest of all the participants, though the bus itself was not the longest, the manoeuvrability was good compared with the others, with an excellent turning circle. The raising of the driving position was also welcomed. A criticism of the mirrors was that, once the front door was open, it was impossible to see what was happening at the other doors. Handling was excellent, minor criticisms being the transmission of bumps through the steering wheel at 50mph/80kmh and the fact that the hill hold requires manual activation. 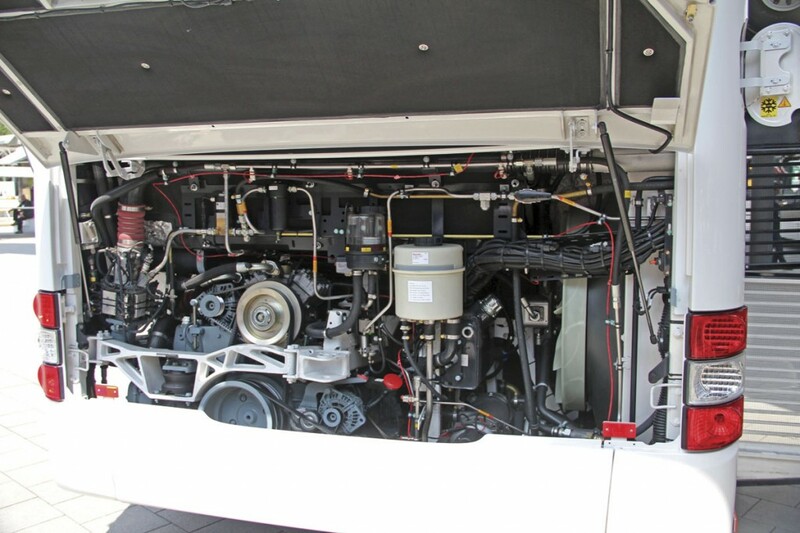 One of the Citaro’s most endearing features is its ability to deliver high torque from low down the rev range. Not only does it go well, it stops well too. Overall a high quality bus that ticks all the boxes including quality. VDL is another recent winner of the Bus of the Year title, indeed, for a while it held both the Bus of the Year and Coach of the Year titles with the Citea SLF and the Futura 2. 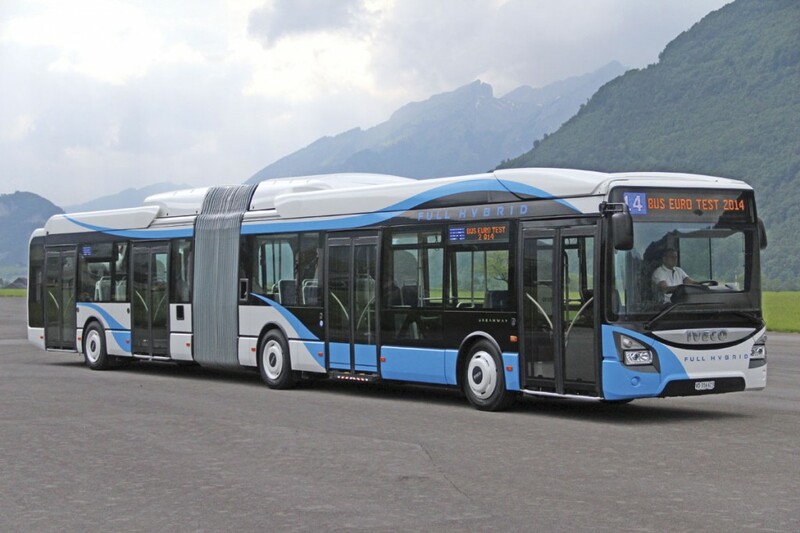 There had been a gap in the VDL line up for a fully lower floor articulated bus for a while and VDL has answered it with the launch of the SLFA. It was pointed out that of 23,000 buses supplied in Europe last year, close to 2,000 were articulated. The bus maintains VDL’s key philosophy of low weight for low fuel consumption and good capacity within a heavy duty bus, along with the ideas of pride of ownership, profit of ownership, attractiveness to passengers and with good driving and handling. 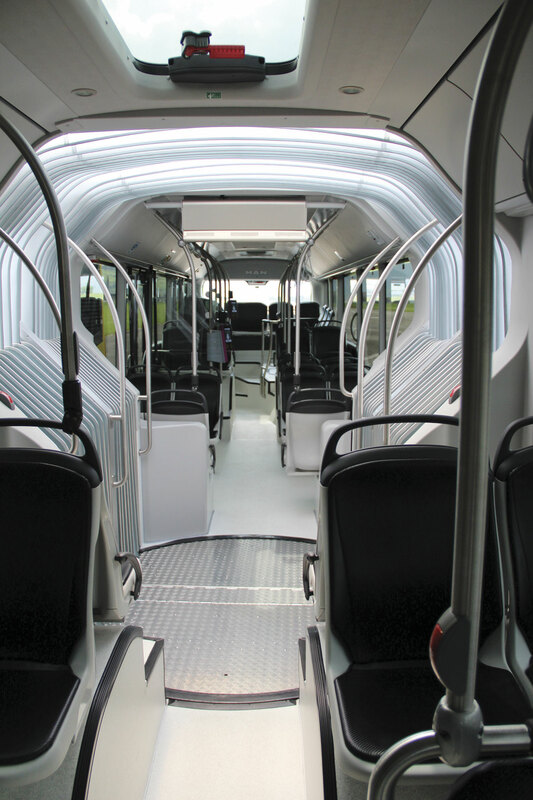 A modular stainless steel framed integral design, it can also be offered as an 18.75m long bus in addition to the 18m version entered, the longer version having four additional seats in the low floor area. At only just over 16 tonnes for a bus with 51 seats installed, the SLFA had a weight advantage over its competitors. For Euro6 the company has forsaken the DAF/Paccar engines it has hitherto offered in its premium bus ranges in favour of the Fiat Power Train (FPT) Cursor 9 unit. It is a fairly high revving unit delivering the maximum power of 360hp at 2,000rpm, but it is nevertheless smooth in operation. Maintenance intervals are 50-60,000km. 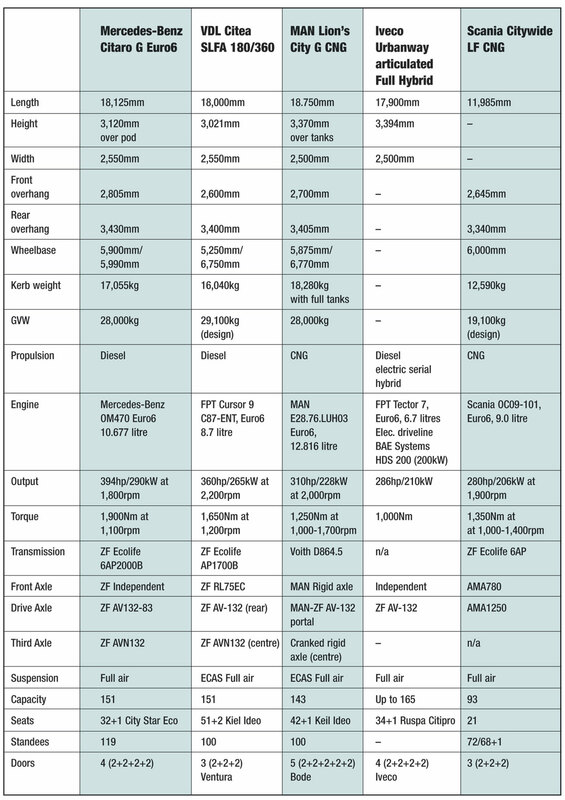 Gearbox options are either the ZF Ecolife or the Voith D864.5 while the axles and steering are from ZF. 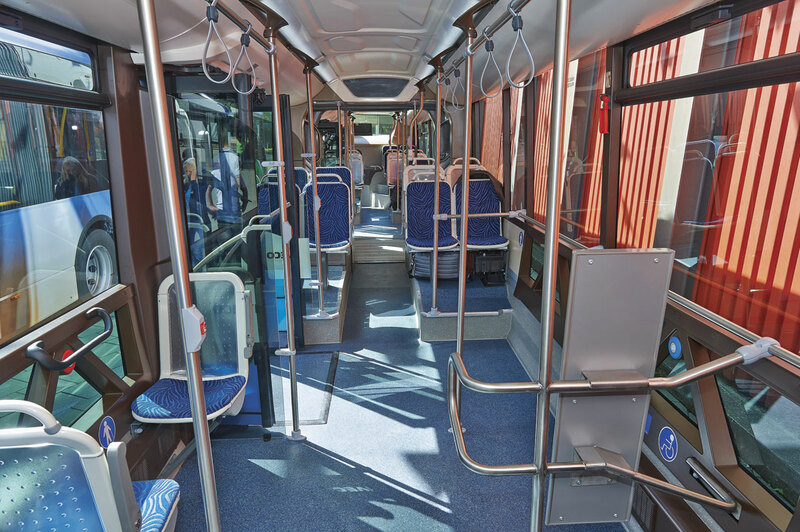 Inside, VDL continues the philosophy of simplicity within the saloon where the use of cantilever seats and the absence of unnecessary obstructions ensures that the seats are generally more accessible and the bus is also much easier to keep clean. It was entered as a three door bus with a seating area at the nearside rear but can be supplied with four doors instead. All interior and exterior lights are LEDs which give excellent light and are economic to operate. Depending on configuration, the price would be between €320,000-350,000 (£254,500-£278,300). 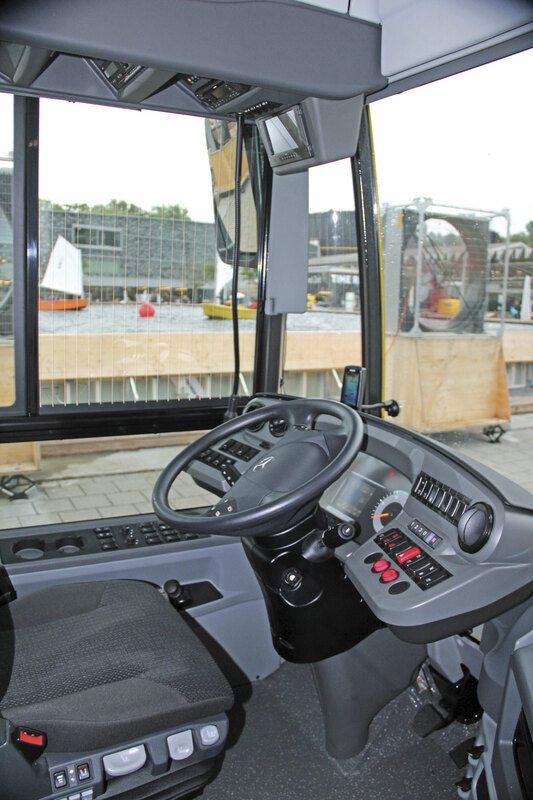 From the driving perspective, there is much to praise about the articulated Citea, as there had been with the 12m version. It is easy to drive, handles well, most people liked the driving position, the steering is good (though the pump is quite noisy on oversteer), it feels powerful, there was praise for the front suspension and noise levels are low with what noise there is created being of a low frequency. 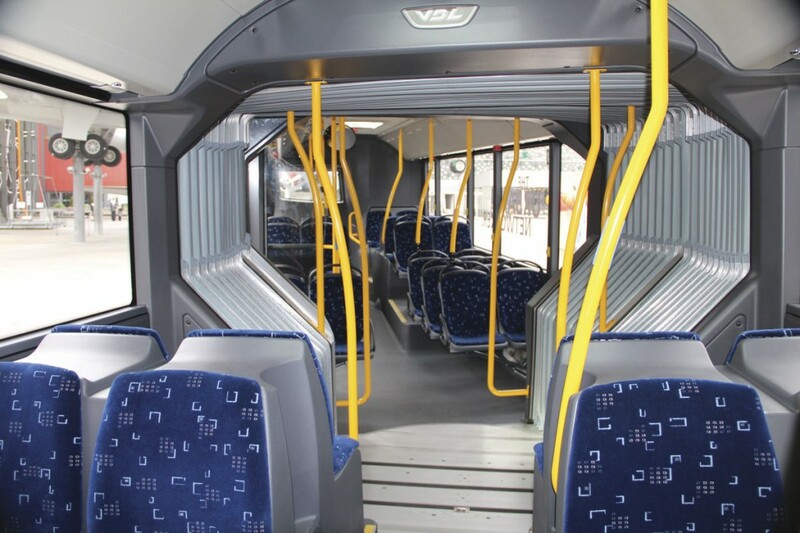 For passengers, the smaller windows and the use of darker colours meant that there seemed to be less light than in most of the other buses, particularly around the articulation unit which was noisy compared with the quietness of the rest of the bus, but it was comfortable, well finished and easy to use. It has something for everyone because as well as being good to drive, it is comfortable to ride on and the maintenance aspect has been well thought out with everything easily accessible. As one jury member put it, ‘it doesn’t look exciting but you appreciate it when you drive it.’ Overall, it was proof that lower weight and price doesn’t have to mean lower quality or comfort. 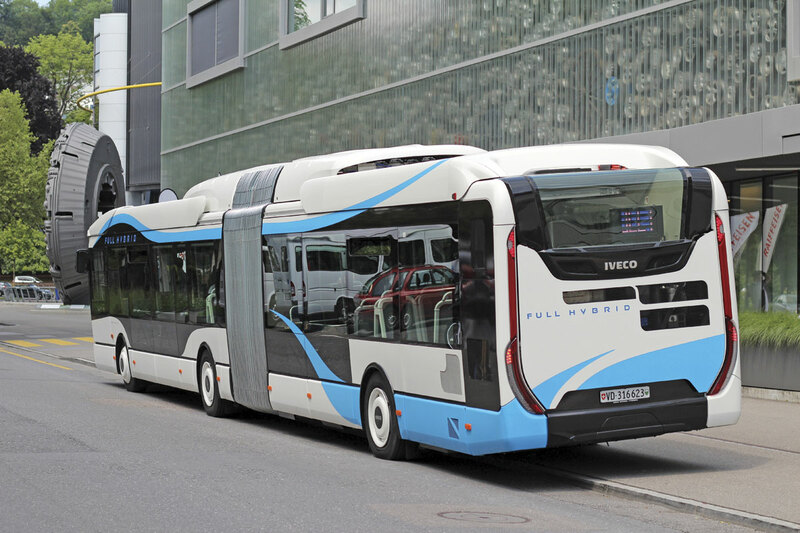 Built at Man’s Polish plants at Starowice and Poznan, the Lion’s City G CNG is an 18.75m long bus that maintains the familiar MAN look of the last decade or so, rather than the more adventurous look applied to the 12m hybrid seen at the last BusEuroTest. 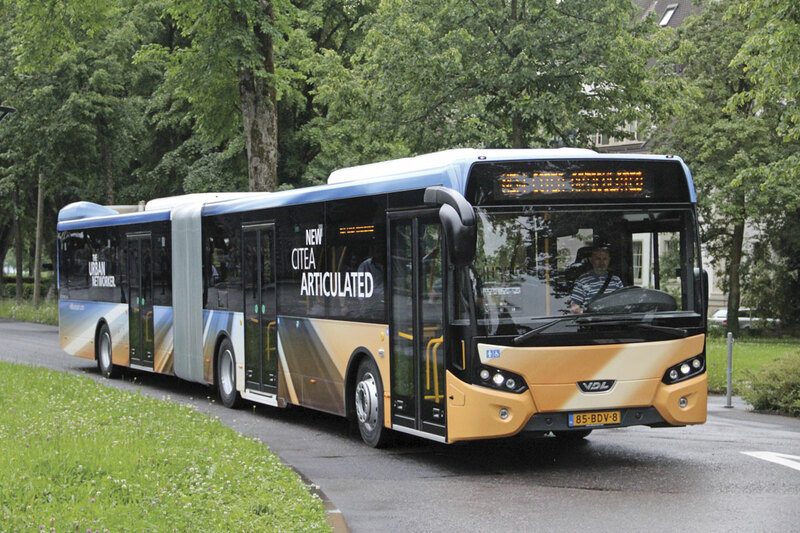 In the UK we are already familiar with the technology at Euro5 level as it has been supplied to Arriva and Anglian Bus in buses supplied by MAN with Caetano bodywork, although I thought the slide headed ‘Natural-gas buses sweep England’ was perhaps over-egging the pudding a little. There is very little difference between MAN’s Euro5 gas engine and that in the Euro6 with the same 12.816-litre lump used and essentially only the combustion settings changed. Fuel storage consisted of ten 205-litre tanks mounted on the roof giving a total capacity of 2,050-litres. Based on a ten year calculation and 60,000km annually, MAN claimed that the gas engine would save 15% over the cost of running a diesel bus. It only needed an order for 15 CNG buses to make the installation of a refuelling station viable. As shown, the cost of the bus was around €400,000 (£318,000). 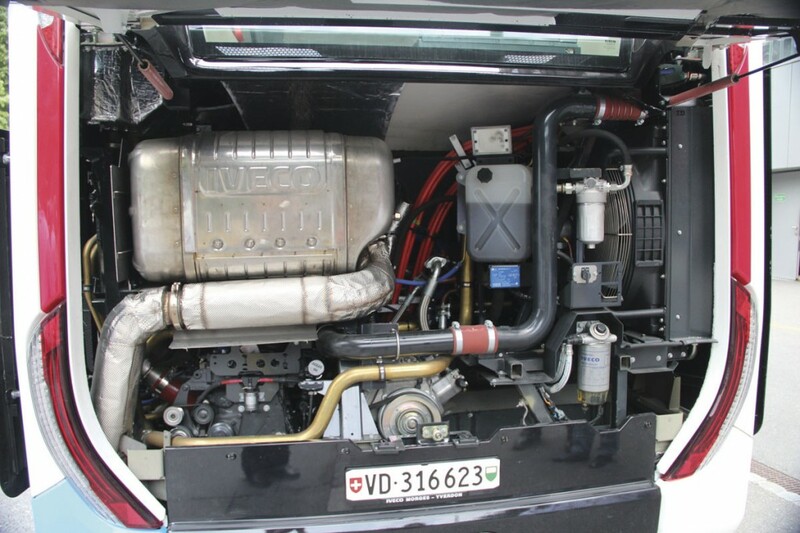 Opting for gas propulsion does have an impact on the overall capacity of the vehicle, the 169 maximum possible in a diesel engined version reducing significantly to 143 in a CNG bus. MAN countered this saying nobody gets on a bus that already has 140 people on board. 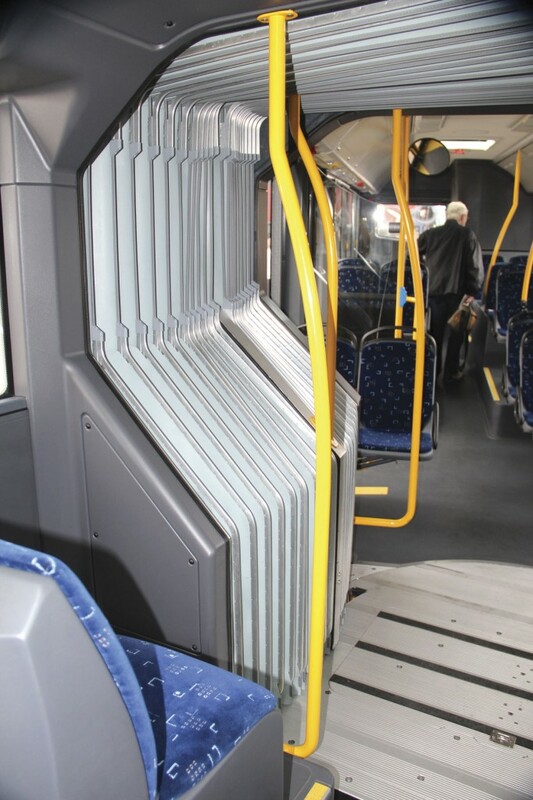 A carryover from MAN’s participation in the European Bus System of the Future (EBSF) project, in which MAN worked with the Budapest municipality, is the provision of no less than five doorways within the length of the bus. MAN claim that independent research shows a reduction from 26 seconds to 16 seconds in the time taken to board 40 passengers compared with a four doorway bus. I thought this an astonishing figure. 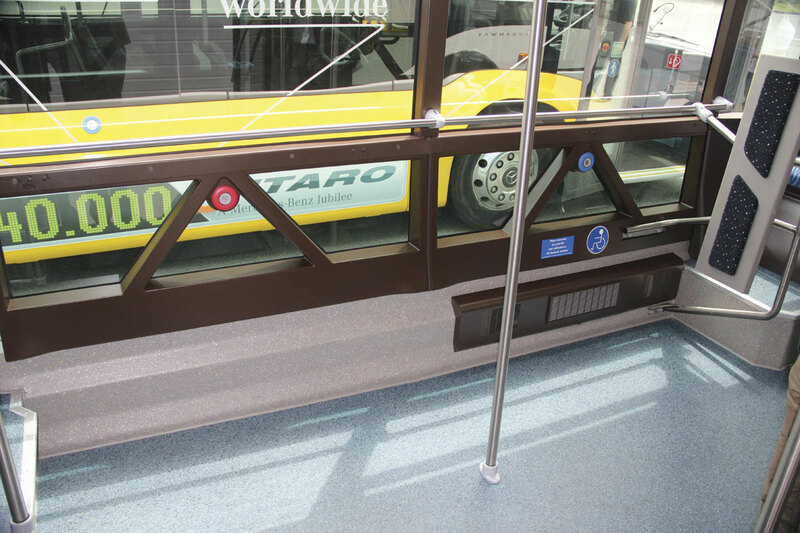 Door operation is dictated by the passengers for, while the driver has a separate button to control the first five doors, passengers have to press the relevant button for doors two to five to open, though they all close at the press of one button. An unusual aspect was the use of a television screen style destination display which was almost impossible to see clearly. A body feature I liked was rain sensors linked to the roof hatches so that they close automatically during showers. Why didn’t anyone think of that before? Driving the Lion’s City was a positive experience for jurors, who liked it even though the driving position was the lowest of those evaluated and the steering wheel seemed large. 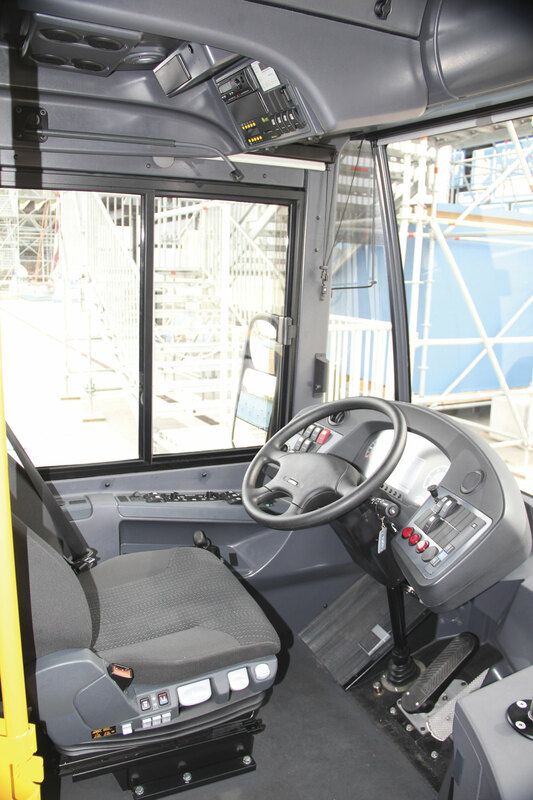 Visibility for the driver was good and there was a welcome spaciousness about the cab area. 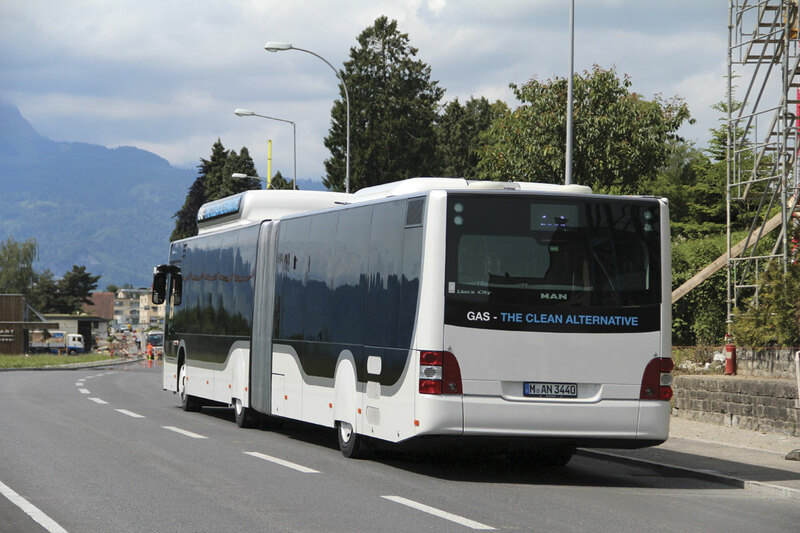 Response to the accelerator was good, gone are the days when gas buses lagged behind in terms of performance, and it was also smoothly delivered. Cruising at 45kmh in the four-speed Voith’s top gear the tachometer was only showing 1,150rpm. The retarder operated steplessly in a smooth and continuous manner. 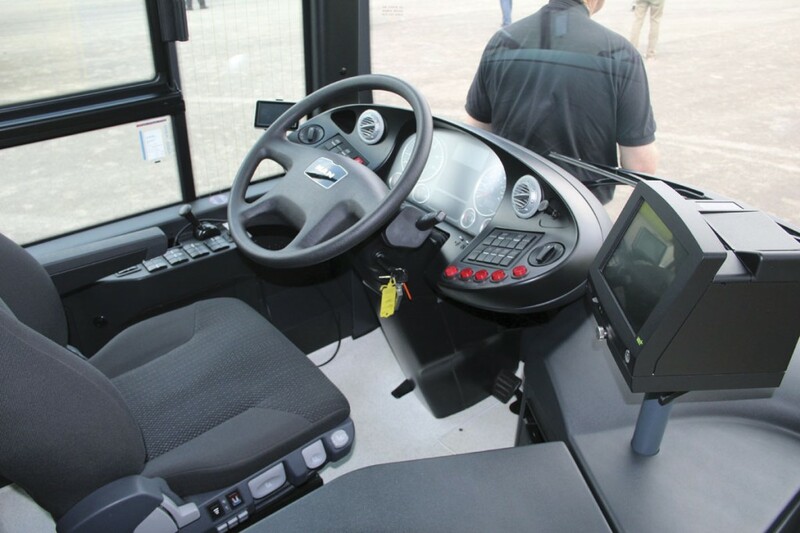 A hill hold feature was incorporated but it required the driver to push a button every time to activate it. The parking brake was not required once the function had been activated. 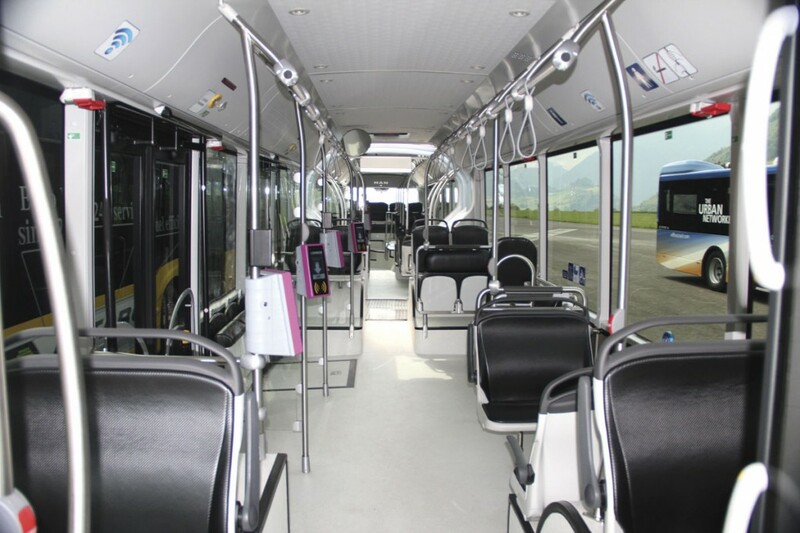 For the passenger, the interior was probably the most welcoming of all of the candidates with bright colours and attractive pink stanchions though one questions how the white floor sections will look after a while in service on a rainy day. One juror who had taken his wife along told us that it was her favourite. Excellent passenger flow was achieved through the five doors, and the provision of tip up seats that can be used off peak helped make it quite a flexible vehicle, though the step arrangement providing access to the seating at the rear was somewhat complicated for my liking. Overall, a good bus to drive incorporating some novel ideas. It looks like a show exhibit, which it had been, but combines some interesting commercial and environmental attractions in a passenger pleasing package that carries slightly less than a diesel bus. Looking to the future, Iveco predict that while diesel buses accounted for 85% of their bus production in 2013, that figure will fall to 60% by 2018 and only 30% by 2025, which is no doubt why they opted to enter a very early example of the new Urbanway in hybrid rather than diesel form. It may utilise the same BAE Systems hybrid technology that ADL uses in its hybrids, but you will not have seen anything like the Urbanway rolling out of Scarborough, Falkirk or Guildford. For one thing it’s an artic and for another, with the optional roof shrouds, chunky interior mouldings and glazed lower side panel sections in the saloon, there is definitely a French distinctiveness about the design, giving it an imposing presence that stands out. 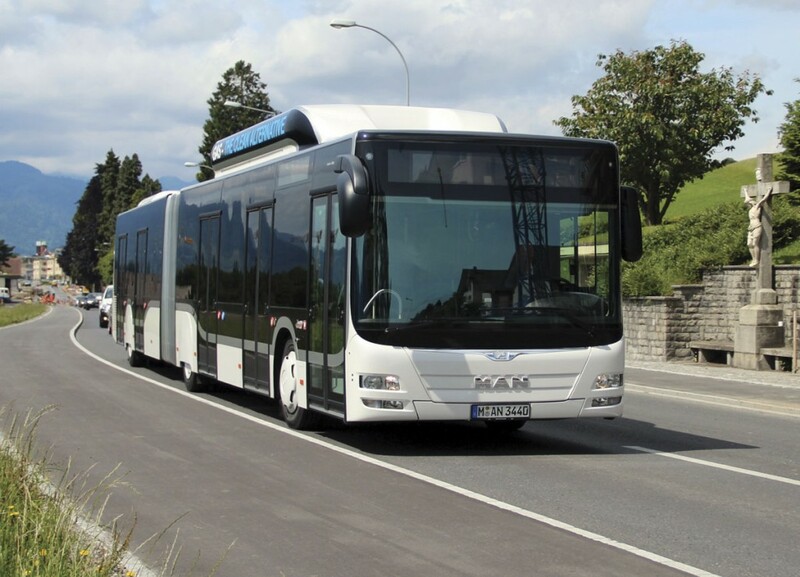 The Urbanway range, built at Annonay in France, replaces the previous Citelis family and Iveco’s engineers (the Irisbus name has been abandoned) have worked hard to improve on what was already a very convincing city bus package. In addition to a saving of 300kg within the bus structure, the load on the rear axle has been reduced by 500kg through moving components further forward and using a smaller engine mounted transversely. In turn, this weight reduction has enabled a 11% rise in passenger capacity from 130 passengers to 145. The air conditioning, powered by a belt driven air compressor, delivers 65% of its output centrally, 10% on the windows and 25% through air curtains at the four door apertures. All lighting is LED and there is an option of a second strip of lighting that can be a different colour to create an ambience. The interior treatment is unusual in that some of the plastic mouldings used are a dark brown colour, rather than the usual paler greys and blues, and they also appear to be somewhat chunkier than absolutely necessary in order to create a styling feature. I really liked the clever way the coving panels had been deigned so that once they had been removed, they could be hung the other way up in the same aperture without getting in the way of anyone working inside and without getting damaged. I also liked the additional low mounted feature windows. 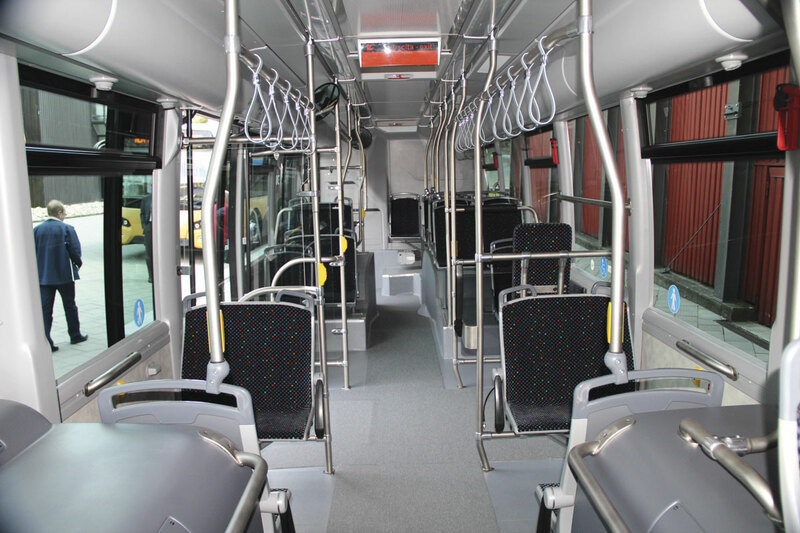 Various seat options are offered but the test bus was equipped with the new Compin SB09 cast alloy units featuring see through back panels. 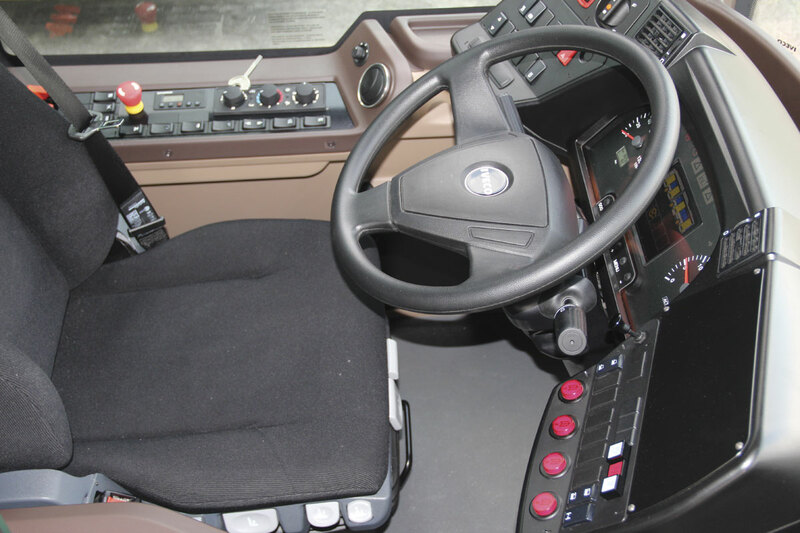 Like MAN, Iveco has used experience gained through the EBSF project to its advantage, especially in the design of the raised cab area, with the needs of women drivers given more consideration, more space created, a large box above and to the rear of the driver capable of taking a helmet, a rotating seat, an electromagnetic cab door lock, a frameless side window, anti reflection glass on the full colour dash display and a new car style HVAC system with six zones within the cab. 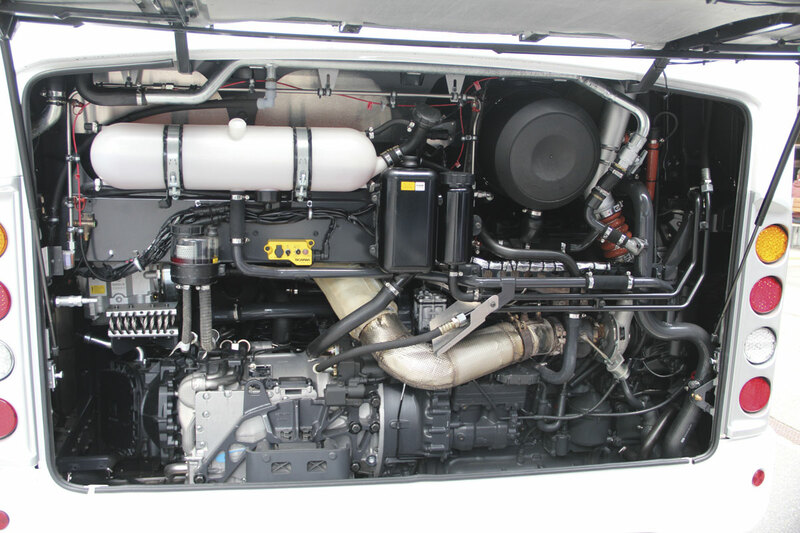 Mechanically, Iveco uses the larger Cursor 9 engine in its diesel artics, as used by VDL, but for the hybrid has opted instead for the smaller Tector 7. This 6.7-litre unit accounts for roughly half of the 800kg weight saving. Renault claimed that the change from Euro5 to Euro6 would see a 5-10% saving on fuel consumption and a further 16% saving on maintenance and repair. Independent tests carried out showed that the hybrid was 40% better than a diesel on NOx emissions and 33% better on CO2 emissions. With the BAE serial hybrid system there is no alternator or starter and the power steering is controlled by an electric pump. The system incorporates the ‘Arrive & Go’ system which switches it to electric mode around bus stops as the generator cuts out at below 20kmh. Far and away the most expensive bus entered, in terms of initial cost, the figure we were quoted was between €500-600,000 (£397-477,000). That’s pretty eye-watering but Iveco are confident that it will deliver payback over eight years including the cost of batteries, based on covering 60,000km annually. Opinion differed on the subjective issue of the Urbanway’s styling, with the balance favourable. There was a feeling that there was too much plastic in the interior and there were also a number of rattles, though this was a very early example of the model. Perhaps the most difficult of the buses to drive to its potential, different jurors I spoke to had very different attitudes to the driving experience. Some thought it spent too long in diesel mode, yet another managed to keep it in electric mode for an extended period. The slightly disappointing aspect of the bus was the way that it performed on hills. The Tector-7 engine was working very hard and creating a good deal of noise doing so. To my mind, an attractive and exciting new product ideal for bus rapid transit type schemes. 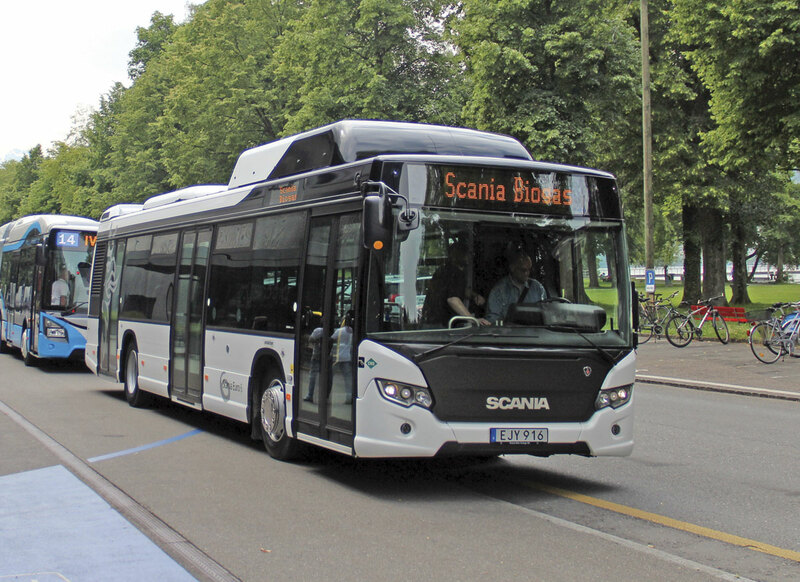 Alone among the candidates, the Scania entry was a 12m long two axle bus, built to an Italian high standee capacity specification though currently working as a demonstration bus out of Sweden. 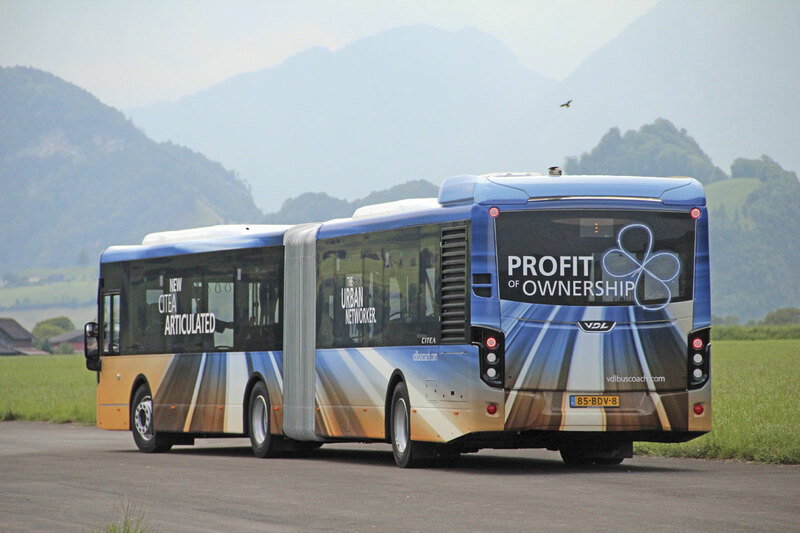 The new Citywide model with its aluminium body is the next step on from the OmniCity, which is not being offered in the UK as the company has decided to concentrate on promoting chassis with local bodywork rather than its in house products for bus applications. 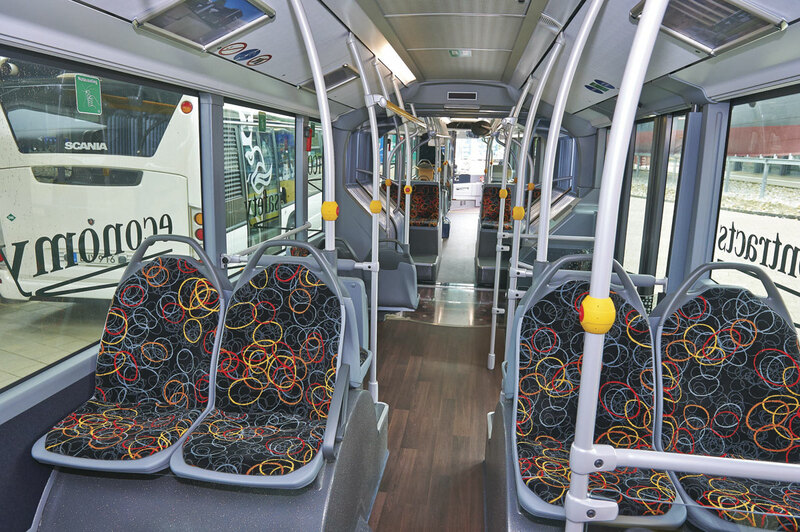 Scania has already supplied Euro6 standard CNG buses in the UK in conjunction with ADL. Wide aisles, but closely spaced seats, a number of them of one and a half seat width, all trimmed in dark colours with unpainted metal stanchions did not make the most of an interior that also suffered from exposed screwheads, an oddly located fuel tank and the absence of a rear window, though the side windows are particularly deep. Scania is enthusiastic about biofuels and it offers specially developed engines capable of running on three of them: bio-diesel, biogas or bio-ethanol. Entered was a CNG/Biogas bus powered by the Scania OC09-101 280hp (206kW), 9.0-litre engine which develops 1,350Nm at 1,000-1,400rpm. In the past lean burn technology was used but this is not an option at Euro6 because it would be impossible to achieve the NOx levels, so the company has changed to using stochiometric combustion to give diesel like performance. The engine uses EGR in order to keep fuel consumption down by avoiding pressure loss over the butterfly valve and thereby increasing efficiency. The fuel is stored in roof mounted 1280-litre tanks at 200bar though artics have a larger 1755-litre capacity. If necessary a lower profile tank arrangement can be supplied. Scania told us that, as demonstrated, they guaranteed a range of 500km in type 1 traffic, or 700km in type 2 traffic. This represents a 6% increase in range over the Euro5 engine. 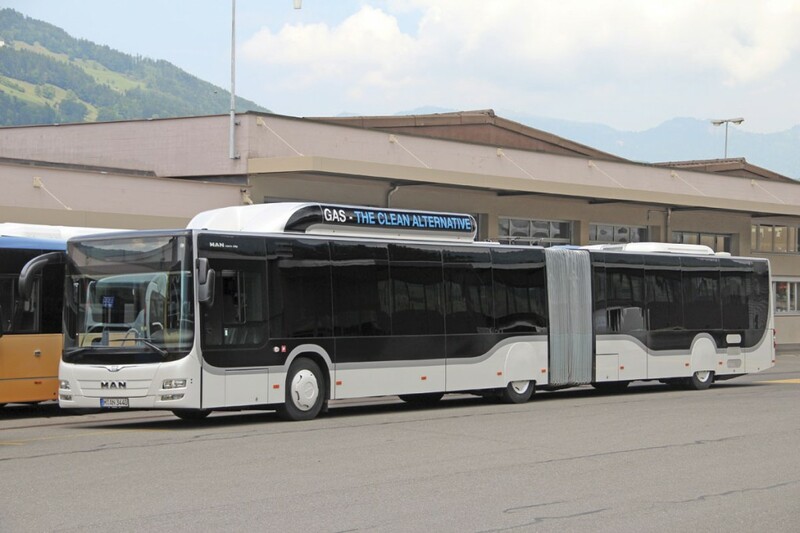 In initial purchase cost terms the CNG powered bus is 10-15% higher in price than a standard diesel, though the claim is that it will be more competitive in terms of total overall price. The cost between Scania’s CNG and diesel options is narrowing because while diesel versions have gone up by around €6,000 (£4,771) with Euro6, CNG prices have stayed at Euro5 levels. Scania claim that the total cost of ownership at Euro6 is 11% lower than at Euro5. They further believe that, politically, CNG is unlikely to increase in cost compared with diesel. It is always difficult to give an exact price for a bus because the specification varies from market to market but we were told that a standard 12m vehicle would cost in the €230-250,000 (£183,000-199,000) range. Scania are not offering an LNG fuelled version though the engine is capable of being produced in a format that would take it. Despite the gas engine, the level of noise in the interior felt relatively high, with sound coming from the driveline, despite the inexplicable presence of a carpet down the aisle. 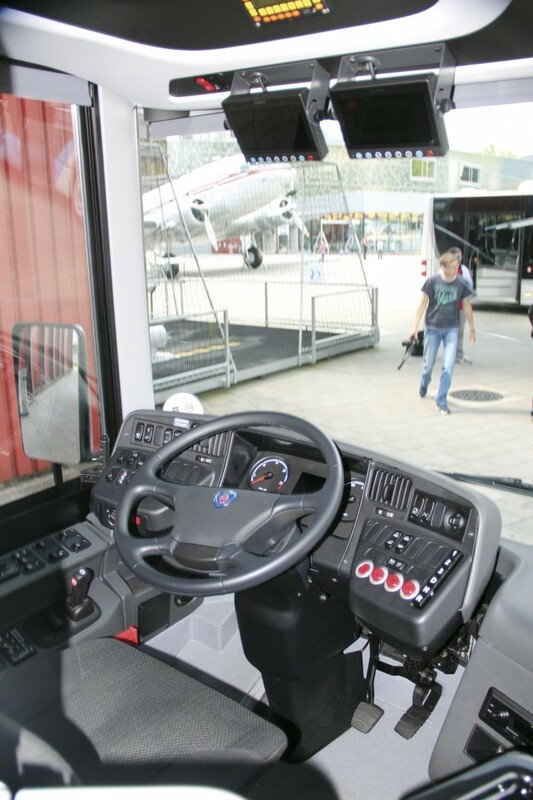 Drivers liked the driver’s view, the dash layout and most liked the cab itself along with the fact that the hill hold was fully automatic (a feature only the Iveco shared) though there was some criticism of the mirrors, one of which obscured another mirror. The engine was smooth and diesel like, providing the revs were kept up, but the ride at the front was relatively harsh. The BusEuroTest is a unique event in the calendar as it represents one of very few opportunities for direct comparison of different buses on the road in the same conditions. Conducted in a relaxed professional manner, it also gives the manufacturers a rare opportunity to experience their competitor’s products at first hand. The winner of the International Bus of the Year 2015 title will be announced on 23 August and the prize will be presented at the IAA exhibition in Hanover the following month.